Combines the advantages of MetroMax i™ and MetroMax Q™ to create a storage system that's perfect for you - we call it MetroMax iQ™. • Quick to Adjust: Patented Corner Lock Release allows shelf adjustment in seconds . . . without tools! Shelves adjust at 1" increments. • Quick to Clean: Open-grid mats lift off for cleaning and fit easily into the dishwasher. All MetroMax Q shelving comes standard with Microban‚® antimicrobial product protection, built into the shelf mats to inhibit bacteria, mold, mildew and fungi that cause odors, stains, and product degradation. • Quick to Assemble: Assembles in minutes without tools! • Quick to Adapt: A wide range of accessories are available. • Quick to Move: Add any standard MetroMax Q casters to create a functional mobile unit. • Quick to Last: Polymer shelf mats have a lifetime warranty against rust and corrosion. Posts have a fifteen-year warranty against rust and corrosion. Use with MetroMax iQ stem caster posts to create a storage and transport unit to meet you needs. 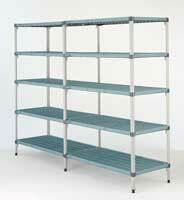 • Starter Units consist of four posts and indicated number of MetroMax iQ shelves. • Add-On Units consist of two posts, indicated number of shelves, and two “S” Hooks per shelf, for attaching shelf to adjacent unit.